When I first read about the “breakthrough” book based on the “startling” new research from the Nurses Health Study, I thought, ‘Finally, after 13 years of teaching workshops on the link between fertility and food as one aspect of reclaiming our hormonal health, here is a Harvard team validating my work.’Then, as my copy arrived and I began reading, I realized how lucky I was that The Fertility Diet was not in print at the time of my own diagnosis 16 years ago. Otherwise I, too, might have been tempted to follow it. And that would’ve been a mistake. In 1992, I was in desperate search of a miracle cure for my furiously rising hormone levels which – according to a well-documented study – reduced my remaining childbearing years to zero. At the time I was eating close to the recommendations of The Fertility Diet: whole milk products, brown rice, tofu, nuts and fruit, multigrain bread, an afternoon desert and coffee. Yet there I was, at 42, going into premature menopause with several endocrinologists proclaiming my “ovulatory infertility” to be beyond repair. One day, in a last-ditch effort to prop up my wilting ovaries, I resolved to raise the bar on my eating habits. The first food I eliminated was dairy. My decision to do so was inspired by my chronic sinus headaches. Several sources indicated a strong correlation between milk products and high levels of congestion. Amazingly, after three dairy-free weeks, my sinus headaches vanished. And eight months later (following a regimen of additional diet changes and rigorous self-examination) I conceived a baby girl. After publicly sharing my story, I received hundreds of e-mails from women who emulated my process with similar results. Notably, in 1994, the year of my daughter’s birth, a large scale study in the American Journal of Epidemiology (Cramer et al., 1994 Feb, 139(3):282-9) surveyed women in over 35 countries, showing that those in countries with the highest milk consumption experienced the sharpest, age-related drop in ovarian reserve. Women between the ages of 35-39 reported the highest rate of declining reproductive function. Some experts proposed that this delayed impact might’ve been caused by the cumulative toxic effect of galactose on ovarian germ cells. No, not everyone needs to give up dairy to become pregnant, though a substantial body of clinical research documents the adverse effects of dairy on endocrine and immune health. Overall, for the reader who has not done extensive prior research, many of The Fertility Diet recommendations can be dangerously misleading. 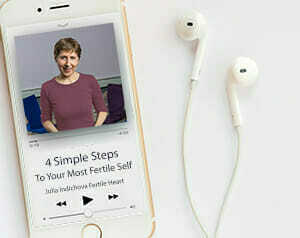 Consider this: “It has been hard to keep up with the fortunes of soy over the last decade…” followed by: “don’t turn up your nose at tofu… or ignore soy milk…” If you’re going to write a book entitled The Fertility Diet, you might care to do what it takes to keep up with the fortunes of soy. Women with irregular ovulation might in fact, do best to turn up their noses at tofu and soy milk. Non-fermented soy products have been linked with impaired thyroid function — not a desirable condition for an aspiring mom. Here is another equally troubling recommendation: “Drink coffee… and alcohol in moderation…we didn’t see any effects on fertility at moderate levels of caffeine intake, which is the equivalent of three to four cups of coffee a day.” The interested reader will indeed find a number of sources documenting the adverse affect of caffeine, including higher miscarriage rates, increased blood pressure, excessive urinary excretion of magnesium, potassium, and calcium (essential nutrients for maintaining a healthy pregnancy), to name a few. The followers of Dr. Chavarro’s guidelines might want to take note of an alarming piece of research (Welsch et al., Int J of Cancer 1983, 32:479-84) that points toward a larger risk of mammary and bladder cancer among coffee drinkers on a high fat diet. And if none of these findings were convincing, when attempting to create a most welcoming environment for new life, wouldn’t it make more sense to abstain from ingesting a substance that leads to physical dependency serious enough to result in withdrawal symptoms? What about the suggested curative effect of ice cream and whole-fat dairy? Tinkering with the natural proportion of elements within a food system has been known to spell trouble. Thus, whole-fat foods are for the most part healthier than their low-fat counterparts. But the claim that whole-fat milk products in particular are responsible for reversing ovulatory imbalance is highly misleading. Looking at the original study, one could also easily surmise that women who eat low fat dairy are likely to be chronic dieters with fluctuations in weight. And such fluctuations have been known to result in impaired hormonal health. The reason that even one serving of low-fat foods is shown to increase the risk, is not the milk, but the fact that it marks a particular personality trait and relationship to food in general. In the last 14 years of counseling people with ovulatory issues, I have found that eight out of 10 women have digestive difficulties. I wonder about the effect of a four cheese soufflé, a few cups of coffee, a glass of wine, fruit desserts, and nuts and berries for an evening snack — to name but a few suggestions in the back of the book – on an already compromised digestive system. By no means am I implying that scientific research is to be dismissed. But in case you’re tempted to wait for the Harvard sequel (Dr. Chavarro has assured us that “Plans are underway to conduct a…study to test the diet in a more scientifically rigorous manner…”) to determine your dinner menu, here is something I learned observing hundreds of people who conceived robust babies, often in direct contradiction of current food science dogma. When it comes to something as dynamic and mysterious as a human organism, as complex as food, and as miraculous as creating a life, nothing can match the value of doing your own thinking and the solid science of direct observation.